This post is very over due because it combines 2 things that I am so passionate about…food and Hoboken! I have lived in Hoboken for 4.5 years now and my husband has lived here for 7 years (since back when he was just my boyfriend and I would visit him). I love this square-mile city so much! Hoboken is only 1 square mile so you can easily get everywhere. It has a slower pace than the concrete jungle across the river but still has easy access to Manhattan for work and play. The views of the river and skyline from my building (and many of these restaurants) is iconic and I feel grateful every single time I see it! I love that there is open, green space and a neighborhood feel. For some reason, I find it comforting to pass so many of the same people on the street. Part of that neighborhood feel is the restaurants! I love having our go-to spots and that so many of them are relatively affordable (when compared to NYC) and BYOB. Now, I want to share those spots with you! In this post, I cover why/when you would go to each of these spots and some of my favorite items at each of them. I am a vegetarian so I also talk about my husband’s favorite items (he eats meat). I cover a few different categories to make it organized and easy! One of my husband & my favorite things to do on a weekend is just take a walk to coffee shops in town. We love being able to walk right out of our apartment, hand in hand, and wander through town. We don’t buy coffee/tea during the week so its a special treat when we do. In this post, I share my favorite coffee shops! I also cover my favorite brunch spots and even talk about my techniques for making process of waiting for a table more enjoyable. I know how tricky large group brunches are so I share my favorite go-tos for birthday brunches and larger gatherings. I list out my favorite dinner spots and describe the atmosphere/appropriate occasions. I also talk about my go-to delivery spots (we get the same things delivered on rotation and I’m not even ashamed about it because they are just SO good). Then, I talk about different bars. In full transparency, I don’t go out to bars at night frequently due to my chronic pain issues, which gets worse later in the day. I’m more likely to frequent a bar during a nice day or attend a happy hour. Therefore, I brought my husband into the mix on this topic. There are also a ton of Irish pubs in downtown Hoboken but we’ve really graduated from that scene by this point in our lives (they are great for the post-grad phase of life), so I don’t know much about them anymore. Finally, I cover the best delis in Hoboken! Hoboken has a strong Italian influence, culture and history. It is the birth place of Frank Sinatra and has a ton of ‘OG’ Italian Americans. Therefore, the Italian food, including delis, is really important here. The fresh mutz is unparalleled and there are too many pizza spots to count (I included my all time favorites in the delivery and dinner sections). These delis are no-frills and super old school. They aren’t the nicest things to look at (its a to-go situation) and follow their own rules. They give the impression that they aren’t aiming to conform to the service industry standard but their food exceeds any standard in place. We love getting items from the deli and then eating them at a picnic! It’s a lengthy post but I hope that it’s helpful! Sending so much love to all of my fellow Hobokenites! If you have a favorite spot in Hoboken, please drop it in the comments! Bluestone Lane: The best chai tea latte (although the portion size is weak). They have outdoor seating with wait staff too, which is nice. They have healthy food options, which are served brunch style by a waiter. You can order coffee at the counter in to-go containers, which is what I usually do. Bwè Kafe: This name means “drink coffee” in Haitian Creole! This is right up the street from me and has a cool boho atmosphere that makes you feel relaxed (when its not super crowded). They are a socially responsible company because they donate a portion of their proceeds to Haiti relief efforts. They sell healthy treats and also usually carry baonanas, which is the best banana pudding ever (my favorite flavor is the French Toast but the classic is also so good). I think that Baonanas is better than Magnolia’s banana pudding and I love supporting a small business (the business story is cool). If I’m at the coffee shop on a Saturday morning, I’ll sometimes grab one of these to stick in my fridge and eat for dessert at night. Choc-O-Pain: A great spot for pastries when you want to be more indulgent! The other 2 coffee shops have a healthier flare and this spot brings the buttery, flakey goodness! They have two locations. The downtown location has more of a Parisian cafe, cozy feel and the uptown location is more sleek and bright/airy and has a ‘playroom’ with toys. Anthony Davids: This is my #1 favorite brunch spot! They also have great dinner, which I discuss in more detail below. They have both outdoor and indoor seating in the warmer months. They don’t accept brunch reservations so you should expect to wait during peak hours. I go and put my name/number down and then walk across the street to Bwe Kafe and grab coffee/tea and either hang out in the coffee shop during the colder months or go for a walk with the coffee/tea in the warmer months until my table is ready at Anthony Davids. I LOVE the challah french toast and highly recommend it! I also like their salads. They have unique Eggs Benedict creations and everyone loves them. Jay’s favorite are the French Toast and Crispy Bacon Benedict and the Ricotta and Truffle Benedict. He also is a fan of the Guacamole and Spicy Chorizo Benedict, Crab Cake Benedict, Maine Lobster Roll Bay Benedict and the Burger. It’s BYOB so bring a bottle of champagne! La Isla Uptown: La Isla Uptown only serves brunch on Sundays. On Saturdays they have breakfast and then lunch hours. Bobby Flay threw down against Chef Omar of La Isla with his Stuffed French Toast and Chef Omar was the winner! The Stuffed French Toast is really good but super decadent so I recommend getting it as a share item for the table. They have good breakfast sandwiches and a nice variety of breakfast and lunch items. Don’t forget to order their Cuban Latte if you’re a coffee drinker! Plus, they have a bar and serve great cocktails. I share more of Jay’s favorite items in the dinner section of this post. Turning Point: This place wins points for my favorite dish there and loses points for service. It’s got a diner vibe to it and is super casual and laid back. As a result, its very kid friendly. I always expect a long wait before getting seated so I tend to go in the Spring and Fall. 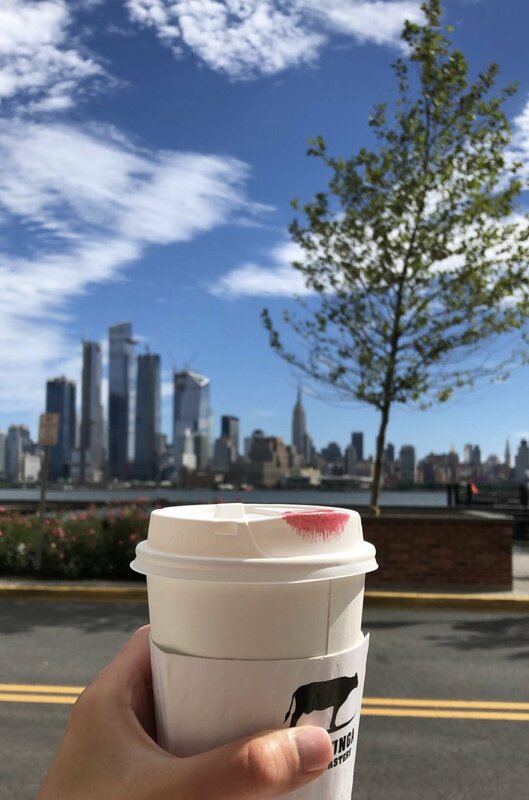 I put my name down in the restaurant section, grab a Chai Tea Latte from the coffee shop section (its so good…definitely more sugary than others but in an addictive way), and sit on a bench out front and take in the skyline views. Sitting along the waterfront makes the waiting process more enjoyable than being cramped inside the small waiting area with everyone else. The other reason that I love going there in the Fall is that my favorite items on the menu are perfect for that season! The Chai Tea Latte and Cornbread French Toast give you all of the Fall feelings! They also set up outdoor seating on nice days, which is great since it has such awesome skyline views! They are BYOB so you can bring champagne and they will make you mimosas. Halifax: This is a big ‘birthday brunch’ spot in Hoboken. This restaurant is in the W Hotel and has a really fun atmosphere, which feels chic and buzzy. It’s great for groups because you can do a set menu and pricing. You have the option of doing a Bubbles Brunch, which includes unlimited food (they bring everything on the menu in small plates, sharing style) for a set number of hours. The unlimited food portion is $25/person but you can add in a bottle of sparkling wine per person for another $10, which makes the whole thing only $35/person. It’s a really good deal and great for any group gathering. Plus, it has big windows and is set along the Hudson River so you can enjoy the awesome views! Elysian Cafe: We tend to go here in the Spring and warmer months because the outdoor section is so charming! It’s a French restaurant and it definitely gives you a Parisian feeling when you sit outside with all of the flower boxes and twinkly lights from the trees. It makes for a romantic date night spot in the warmer months when you can sit outside as well. They have good French Onion Soup and are BYOB. Expect to wait (especially if you go for brunch), but there is a park right up the street called Elysian Park so I’ll typically go for a walk in the park until my table is ready. Bare Burger: This is a go-to casual spot that has a lot of healthy options. They have outdoor and indoor seating. It’s a great spot for kids or for when you don’t want any fuss and just want good, healthy food. All of their meat is grass fed and all that jazz. I love the various veggie burger options and get one of them in a collard green wrap with the special sauce and guacamole. Plus, I always have to get a side of sweet potato fries and spicy pickles. I’ve heard they have good chicken and waffles for brunch and they have other breakfast items on the menu as well. My niece and nephew were hugs fans of it when we took them. Don’t tell them that the milkshakes they enjoyed were vegan! Otto Strada: This is not my favorite spot in Hoboken for brunch on the regular but its a good option for big groups because they can actually accommodate you and will accept brunch reservations. I’ve gone to a couple of birthday brunches here and its a perfect spot for that. They have great breakfast pizzas! They are BYOB for brunch and dinner. Antique Bar & Bakery: Antique is our favorite date night spot and the place that we usually meet up with friends at. Its dark and cozy so its definitely more of a cold-weather spot. It’s got a Speakeasy vibe and great cocktails to match. They play loud music so it definitely feels a little more Manhattan-like than the typical Hoboken spots. Its a great place to order a bunch of food to share. They have a gigantic coal oven, where they cook most of their items in to give them a unique flavor. They accept ‘waitlist appointments, which are basically reservations on Resy. My favorite items are the butternut squash and the cookie skillet (featured in photo above). I don’t typically order dessert at a restaurant unless I’m on vacation (I eat dessert, just once I’m home on my couch in my PJs after an eating break haha) but I always need to get this item. Great, now I’m craving it! Jay is a fan of the steak. Anthony Davids: Our favorite neighborhood spot. I don’t go here too frequently because its a little pricey but when I do I love it. You can bring your own wine, which helps bring down the cost. It has indoor and outdoor seating and even the indoor seating is good. They don’t accept reservations on the weekends. Bin 14: This wine bar is great for a tapas style dinner where people share a lot of food. It’s also a good spot to go out to a real lunch for a meeting or something like that. They have set seating times on the weekends and I would recommend making a reservation on Open Table in advance. Dozzino: This is our go-to casual spot with AMAZING artisanal pizza. My husband and I will typically go here on a Friday night when we don’t have any plans and want to go out last minute. They don’t take reservations and you may need to wait, especially if you’re with a big group. It’s a good option for a big group if you don’t mind waiting though because its BYOB, affordable and has great food. The pizza is classic Neapolitan style and reminds me so much of how pizza actually is tastes Italy. The crust is so fluffy and amazing! They are a no-frills establishment so don’t expect to be treated like royalty (they sometimes give you paper cups and give you a pizza cutter to cut your own pizza). In fact, they may not even have all of the items available (they hand you paper menus with items out of stock crossed off). The laid back vibe is just what I want a lot of the time though. It’s my favorite spot to just wear shorts, a t-shirt and sandals to on a summer night where I sit outside by the twinkle lights at a bistro table. Plus, the pizza is so insanely good that I will ALWAYS go back for more. Let me warn you that they are not open on Mondays (I was crushed one holiday weekend when I went on a Monday and was looking forward to it all day). They have a bocce ball court outside. It’s definitely a favorite in our house! La Isla Uptown: This Cuban establishment is my husband’s favorite spot. He loves the Cuban Rueben and Maduros. It’s got great cocktails (the mojitos are awesome) and a cool atmosphere. The show “Diners, Drive-Ins and Dives” and Drives featured their original downtown Hoboken location. The show highlighted the Papa Relleno (mashed potato stuffed with ground beef, breaded and fried) and Tasajo Con Boniato (braised dry-cured shredded beef served with Cuban sweet potato and rice). The uptown location doesn’t have any outdoor seating but it has a lot of big windows and a modern, airy vibe. This is another great spot for a sit-down lunch as well. Augustinos: If Tony Soprano was still alive and frequenting Hoboken, this is where he would go to dinner. Its a small spot with Italian-American favorites done well. It’s a classic spot that really speaks to Hoboken. Its kind of a hole in the wall in terms of size but has an old school Italian vibe with white tablecloths to boot. My husband says that the Veal Parmesan here is better than the famous Veal Parmesan at Carbone. Unfortunately, its close to impossible to get a reservation here since its a small establishment and so many people have standing reservations. Your best bet is to call and ask to be put on a waitlist and/or call the day of to see if there were any cancellations. Sorrelina: Another Hoboken wine bar! They decorate really nicely for the holidays so I like to go there around that time of year and get a hearty, cozy meal. Its a modern Italian establishment with a bit more of a flare than the classic Italian-American dishes like Chicken Parmesan. They change their menu seasonally, which I appreciate. The Ricotta Crostini is amazing and everyone likes the Ragu Pasta. It can get pricey, especially since its not BYOB like so many of the spots we frequent, but its not anything crazy. They are really knowledgeable about wine and have an awesome selection. They accept reservations and have outdoor seating in the warmer months. Orale Mexican Kitchen: This new spot is a welcome addition in Hoboken. The original location is in Jersey City. It has a trendy and cool atmosphere with crazy decor that makes it fun. It also has some trendy twists on classic Mexican dishes (think truffle guacamole). Its buzzy and loud and a bit of a ‘scene.’ I think that its a spot that you go to for the atmosphere and having a fun Saturday night out with friends or for a first date. They accept reservations with some limitations. 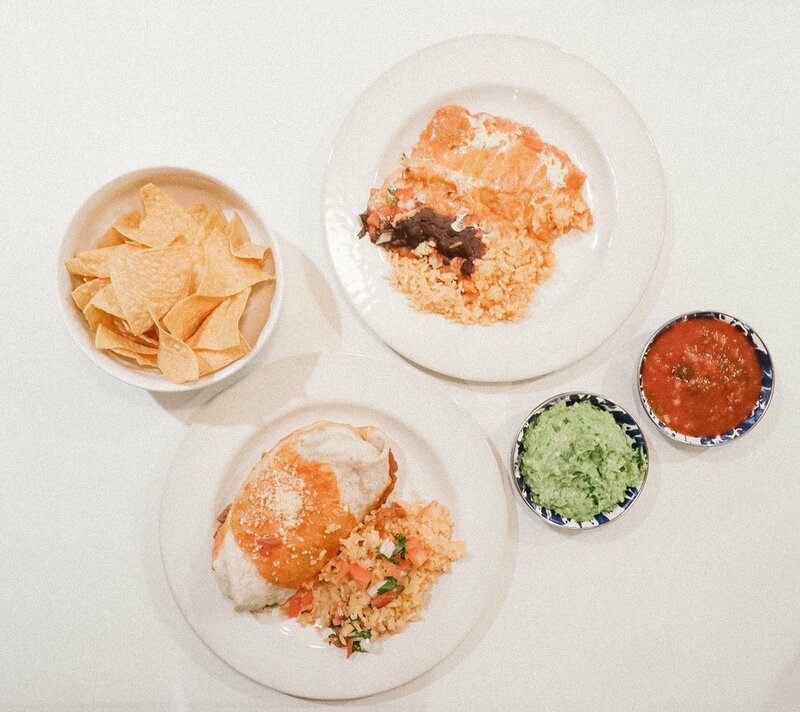 Charritos: There are 3 Charritos locations: downtown (vegan), midtown (authentic Mexican with more entree focus) and a location in Weehawken (tex-mex). We typically get this as our go-to delivery so we don’t go the restaurant unless we have guests in town usually. We used to frequent the uptown location but then it closed and a piece of my heart broke. I go in depth on my order and tips in the delivery/take out section of this post. They accept reservations with some limitations. It’s BYOB and if you bring tequila they can make you margaritas and if you bring wine they can make sangria (with a charge). I haven’t given the vegan restaurant that they opened enough of a chance yet because what I LOVE there is the cheese but I want to go there during the week. Cucharamama: This South American spot has the flare and the food. I prefer going here in the warmer weather and sitting outside. The bread alone is enough of a reason to go! This is a fun spot to go with a group because you can order a bunch of dishes and try them tapas style. The only downside is that they can be a little inconsistent and I haven’t figured out the schedule as to when its been better. They accept reservations. Del Frisco’s Grille: I hardly ever go here because I typically go into Manhattan if I’m looking for a fancy, ‘special occasion’ meal. However, this is a good spot to go with your parents when they visit and things of that sort. Its lively and fun in there. It is a more laid back version with more unique items on the menu than the Del Friscos in Manhattan though. They accept reservations. Amandas: This spot is a little stuffy for me because I’m just not really a white tablecloth gal. However, I appreciate their attention to detail and care for cuisine. I think this is a great restaurant to go to take your dad out to on his birthday or bring your grandma to when she visits. They accept reservations. Saku: I haven’t been yet but I’m so excited to try this new Japanese restaurant that I’ve heard great things about! Charritos: If you follow along on my Insta-stories then you know that this is a weekly staple in my household. I basically need to get Cheese Enchiladas every weekend that I’m home. I want to be ashamed but I’m honestly not because it makes me so happy. The Cheese Enchiladas with salsa ranchera are my favorite. Jay mixes it up more than I do and rotates between the Steak Burrito, different enchiladas, and various tacos. All of the items reheat really well with a quick zap in the microwave. We always get spicy Guacamole, of course. Their chips that come with it are the best! Sometimes we also get flour tortillas, cheese and Guacamole delivered from there to make quesadillas at home and they are so good! It’s my favorite meal of all time! Ever since they closed the 11th street location, I’ve found that getting Uber Eats delivery from the Weehawken location is my best bet for getting the enchiladas just right! As you can see, I take it very seriously! Johnny Pepperoni: We’ve tried so many of the famous NYC & Brooklyn spots and Johnny Pepperoni (aka Jpeps in our house) holds a strong flame against the competition (and beats out many of them). We get fried eggplant (its the thin, super fried kind) and hot peppers as toppings. My husband also loves the pepperoni so he will get that when he’s not eating vegetarian with me. We get their round pie (classic crust thickness) usually but Jay loves getting the square pie (thick, grandma style crust) whenever someone else will order it with him (I like it but would rather the classic and also I’d rather eat more pizza than just one slice of the thicker crust). I always put it in the oven once we get it delivered and just a quick reheat in the oven goes a long way. Trust me, it’s worth the wait and SO good. Grimaldis: A famous establishment for obvious reasons! We typically get the plain pie. Definitely reheat it in the oven. The crust is so good! They do not work with any apps so you have to order directly with them. Honey Grow: My go-to salad place. Its better when you get it there because you have more options than when you get it delivered. It’s also really efficient because they have touch screens where you input your own order. Mamoun’s Falafel: My favorite Mediterranean spot. I usually will get some sort of platter with falafel, hummus, feta, lettuce, and pita. 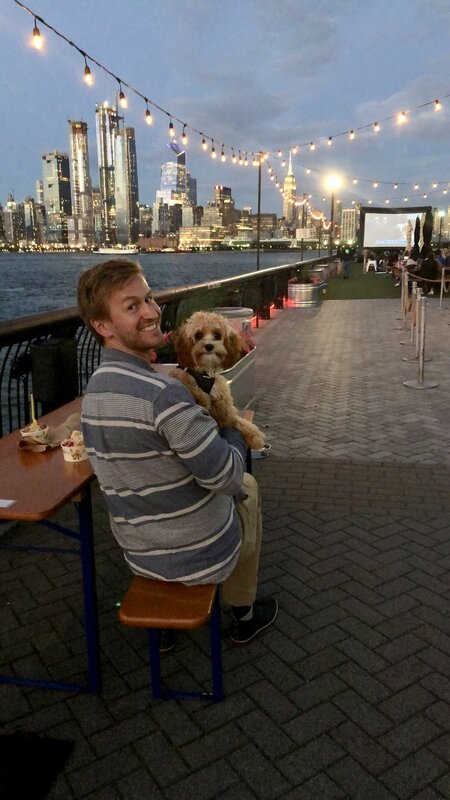 Pier 13: This is a seasonal bar/food truck destination that is set on a pier that juts out over the Hudson river with the most epic views of the NYC skyline. Pier 13 used to be one of my favorite places ever but over the years, its definitely taken a turn. It now attracts a lot of out of towners..some of whom wear heels and get dressed to the nines for this outdoor, formerly super chill bar. They used to have bean bag chairs, Jenga and live music…basically I can’t get over mourning the loss of what it once was. However, I figured out that in order to get that chill atmosphere, I just have to go there during the week and avoid it on the weekends (except some during the day visits on the weekends can be fine). I think that an awesome night out is just walking to the Pier, grabbing food from the food trucks, and going into the bar section to hang out (obviously with beer, sangria or rosé for those who can drink). They also have movie night there where you go and watch a movie on a projector screen! I recommend following Pier 13 on social media so you can see the dates they are open (since the weather really impacts it), the food trucks that they have on site, any events (such as movie night), etc. It’s a really fun and unique spot! Pilsener Haus & Biergarten: I love going here in the warmer months when I can sit outside at the picnic tables! This spot begs you to have a pretzel and beer and just hang with your friends for hours. Make sure to go in the Fall for Oktoberfest! Green Rock: In this area it’s hard to find a bar with such great pricing. This bar will make you feel like you’re back in college with $1 beer happy hour. City Bistro Rooftop: Another good spot for the warmer months. I’ve found the food to be hit or miss so I stopped going there for the sole purpose of having dinner but I think that its a fun spot to meet friends for happy hour with food and drinks. Texas Arizona: For my fellow Penn State alum, this is a great spot to watch the games, along with Village Pour House. Sting Ray Lounge: A more upscale and mature place (hence the lounge name) for an older crowd and/or a good date spot. They serve oysters as well. 10th And Willow: My husband used to frequent this spot during his bachelor/less crazy of a work schedule days. It was his go-to spot for Monday night football because they have all you can eat wings. Wicked Wolf: The most popular place to watch a football game in the square mile. It’s bumping there on a football Sunday! Fiore’s: This is the GOAT deli! It’s old school in every sense. It’s super old school and authentic. The roast beef sandwich is their most famous item but they sell out of it so quickly so you have to go on the designated day to get it. They have amazing fresh mozzarella that I LOVE. They are closed on Sundays and are cash only. M & P Biancamano: They typically win the Mutz Fest competition (a competition where you try all the different fresh mozzarella from the different delis and vote. Mutz Fest has a really cool concept but I didn’t particularly enjoy it because its held inside and was SO crowded and loud. I wish they would do it as an outdoor festival). I will go here and grab fresh mozzarella when I’m making a cheese plate for entertaining, which always goes over well. I also love grabbing mozzarella, bread and olive oil and taking it for a picnic in the warmer months. It’s a major hole in the wall shop and nothing fancy or nice but the owners are just how you want/expect them to be. They’re closed on Sundays and are cash only. Vito’s: Our go-to spot for delivery when we want deli items. We tend to get this in the summer when we can get it delivered to the pool or rooftop and eat outside. There are so many choices in Hoboken but we think this is the best deli that delivers.